When we first bought Your Employment Solutions (YES) back in 1999 I was attending school at the University of Utah. I clearly remember receiving a call from Reed while I was in class informing me that our largest client was doing some layoffs as business had slowed down. I remember a panic come over me thinking this might just be the end. Admittedly, I didn’t understand the staffing industry all that well being so new to the industry. The constant changing in job orders, the hiring and the laying off of employees as clients' businesses grow and retract. It felt like nothing was forever. It was time to figure out who we were and what our mission/strategy was going to be. Because of this early lesson, I knew there were some basic principles in terms of client relationships that would apply in the staffing world. To me first and foremost – It is easier to retain a client than to land a new client or try to reclaim a client that YES had lost. Every effort should be given to make the client happy and to make sure they are getting what is expected. If the client is lost due to poor service, communication, or quality–chances are they will not be returning. Your Employment Solutions is in business to assist their clients specifically in hiring the right person at the right time. Honest and open communication is key. Expectations are made and plans are created through a staffing company’s communication and their ability to follow through with what is promised. Because staffing companies live in a world of constant change with people/potential employees, prompt and frequent communication in required between staffing company and client. For example, if the client is expecting 10 people to show for work the next day and I have only retained 5. There will be a lot of scrambling and the orders planned to be fulfilled might not happen because of the expectation created. By letting the client know that only 5 are prepared, adjustments can be made to make sure the orders can be fulfilled. 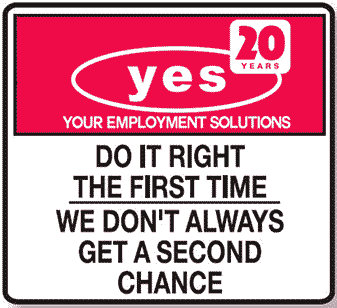 YES is there to help our client succeed.